A Reporter Called Ishaan Khattar A Star's Son, Here's How He Reacted! Home BOLLYWOOD A Reporter Called Ishaan Khattar A Star’s Son, Here’s How He Reacted! A Reporter Called Ishaan Khattar A Star’s Son, Here’s How He Reacted! Ishaan Khattar reacts on being called as a star’s son! Ishaan Khattar, before working in films, was commonly known as Shahid Kapoor‘s younger brother. Nowadays he is making headlines due to his upcoming Bollywood film Dhadak. But it is actually not his debut in acting. Before this, the young actor has worked in the film Beyond The Clouds. Also Read: The Real Reason Why Deepika Padukone Was Replaced From Shahid Kapoor’s Brother Ishaan Khattar’s Film! Directed by the popular Iranian director Majid Majidi, the film also marked the international debut of the Malayalam actress Malavika Mohanan. 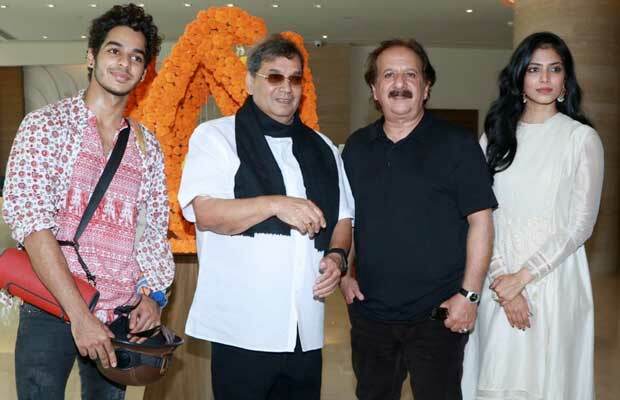 Ishaan was at the International Film Festival of India in Goa for the South Asian premiere of his film. It was very recently that Karan Johar had revealed the posters of Dhadak and had faced flak from people for promoting nepotism in the industry. It is because Dhadak, the remake of Marathi hit film Sairat, features two star kids – Jhanvi Kapoor and Ishaan Khattar. Watch Video: Ishaan Khattar’s Dance Moves Will Make You Go Crazy! Previous articleInside Photos: Kareena Kapoor Khan, Malaika Arora, Karisma Kapoor Party All Night With Their Gang!